Would you like to send emails to colleagues or candidates automatically? Would you like the consent status to change when a placement or candidate status changes? With triggers you are able to arrange your processes in the most efficient ways. IF: "GDPR Candidate legal basis is going to pass in...two months". THEN ACTION: "Send email from template with code..123" (to responsible Recruiter). IF: "GDPR Date legal basis is set passed since...2 months". THEN ACTION: "Send email from template with code...123"
IF: "Candidate status is set to..Employed". THEN ACTION: "GDPR: Candidate term legal basis is set to...execute agreement"
IF: "GDPR: Candidate legal basis is set to...Legitimate interests" THEN ACTION: "GDPR: Term legal basis is set to...1 month". 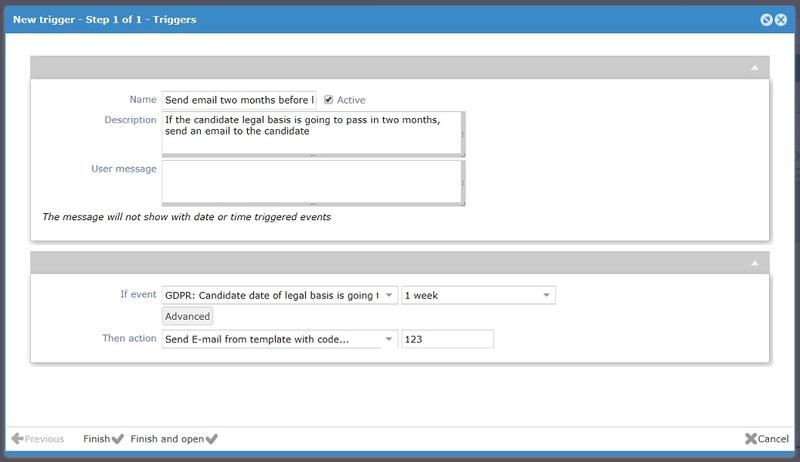 "GDPR: Date legal basis is set passed since..."
"GDPR: Candidate date of legal basis is going to pass in..."
"GDPR: Candidate legal basis is set to..."
"GDPR: Candidate date legal basis given is set to current date (today)"
Read article : How to create a "Send notifications to recruiters upon the expiration date of the consent"